In this chart, Dr. Hansen explains how the GISS record is different from HadCRUT. The essential difference is that there are areas at the poles where GISS has filled in the values by extrapolating from the nearest land based records. Dr. Hansen created a mask of all the areas that HadCRUT does not cover. He then applies this mask to the GISS record and deletes the readings for the areas that are masked off. The resulting chart is marked GISS/HadCRUT mask above. Dr. Hansen then goes on to provide a graph which shows that the GISS divergence with HadCRUT no longer exists after the missing HadCRUT boxes have been removed from the GISS record. So far so good. I think that it is safe to say that the divergence of the GISS record is due to the interpolation and extrapolations at the poles. Now we need to ask the next question - are the GISS interpolations/extrapolations legitimate. 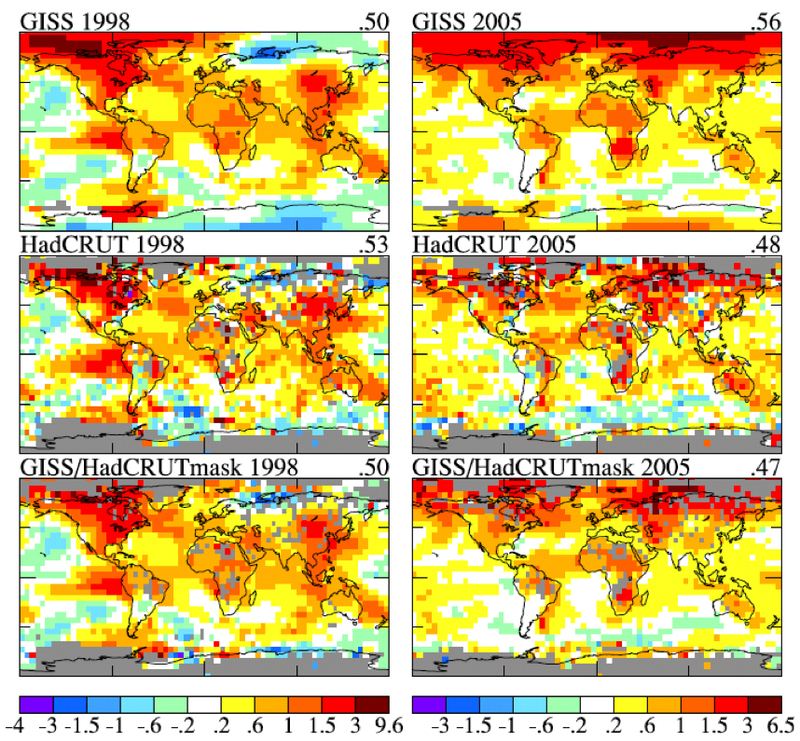 GISS has 2005 as the hottest year for his surface temperature record. HadCRUT and the satellite records (UAH, RSS) have 1998 as the hottest year. So Dr. Hansen compares 1998 to 2005 in his chart, allowing the reader to see why the difference exists. Of course Dr. Hansen considers that his method produces the more accurate result. One of the first things that pops out about the charts is how different the top row of polar cells is between the two records. For example, if one looks at the top row of the HadCRUT 2005 chart, one sees a group of cells directly above Svalbard that are shown as having a cool anomaly in that record. Then, when one looks up at the same cells in the GISS record, one sees that GISS has the same cells colored to the maximum hot anomaly. In fact, the cells that HadCRUT has in the top row (polar area) of that record look very different from the top row of the GISS record. The fact that these cells are so different and that they are accounted for in both records makes me wonder what is going on. Looking at the GISS site, they say this. "Areas covered occasionally by sea ice are masked using a time-independent mask." So if there is sea ice coverage for any part of the year, GISS will not use SST values to cover those cells for the entire year. Those cells must be covered by extrapolations from land for that year. This means that when the area is cover with ice or with water or with part ice part water, it will have it's anomaly extrapolated from land, regardless. HadCRUT, on the other hand, does not extrapolate their coverage. But they will use SST values for a cell when SST values are available for part of the year. If the area is covered with ice for the entire year, HadCRUT will not assign it a value. Therefore we get polar areas that are covered by extrapolation by GISS and not covered at all by HadCRUT. When we look at the HadSST2 record, we see that the cool cells that show up above Svalbard in 2005 are consistent with the numbers in that record. And these then go into creating the sea surface portion of the HadCRUT3 temperature record. So, obviously, how cells are filled with data can have a profound effect on the anomaly value that those cells have. This leads one to wonder if extrapolations at the pole are legitimate. I decided to look at some of the northern Russian stations, at the GISS site, that show up as being so hot in the 2005 version of the GISS chart when compared with the 1998 version of the chart. I found that those big changes are in fact represented in the individual records - especially for the coastal stations. Here are three of them. Kanin Nos: 68.7 N, 43.3 E.
Ostrov Vize: 79.5 N, 77.0 E.
Gmo Im.E.K F: 77.7 N, 104.3 E.
For comparison, let's look across the Arctic ocean and see what was happening in Canada and Alaska at the same time. Eureka, N.W.T. : 80.0 N, 85.9 W.
Barrow, Ak. : 71.3 N, 156.8 W.
So it seems that the North American side of the Arctic changed little, or even got cooler between 98 and 05, the Russian side warmed considerably. Why is that? I think that this ice cover map gives us the answer. As is immediately apparent, the coastal ice cleared out far earlier in 2005 in northern Russia than it did in 1998. This is even though the rest of the globe was slightly warmer in 1998 than in 2005. When dealing with coastal stations, removing the ice and exposing the water is like taking the hatch off a heating source for the coastal thermometers. For stations that are in areas where the temperature is well below zero, exposing the immediate area of that thermometer to a surface that is above zero, changes everything. Looking at Ostrov Vize, we see that it is a small island, and therefore even more subject to changes in coastal sea ice. And when we compare 1998 months on this island with 2005 months we can see that there are differences in some of the monthly means that are larger than 10C. Even a partial ice cover as opposed to a complete ice cover will supply the stations with more heat. So I think that we can safely say that the huge change in the anomalies of Russian coastal stations is mostly due to coastal sea ice changes. In fact, if we look at stations further inland in Russia, the coastal effect begins to decline. With this in mind, we need to ask if the GISS extrapolations of land based stations, particularly coastal stations, to the poles is appropriate. The answer would seem to be that it is not, and the Svalbard case makes this perfectly clear. There we had a case where the SST anomaly was actually cool, and yet the land based extrapolation actually turned those sea based cells more than 3C hotter. Reaching across the Arctic Ocean with temperatures that are the result of a coastal sea ice effect cannot give valid answers for what the temperature anomalies away from those coastal stations should be. In fact, taking the variation that is represented by those coastal stations and extrapolating into the interior of Russia is also not appropriate, because the interior areas did not undergo the magnitude of temperature change of the coastal stations. Looking at the SST temperature anomalies that NOAA uses for 1998 and 2005 it again looks like nothing exceptional was happening in the Arctic (Note, the chart will not retain the months that I selected; so use your own sample moths and they will plot). It seems, from this analysis, that GISS polar extrapolations and interpolations are likely to simulate large variations away from the Arctic coasts that are really only present as changes at the Arctic coasts. And the GISS divergence from HadCRUT, as well as from UAH and RSS are likely to be errors instead of enhancements. 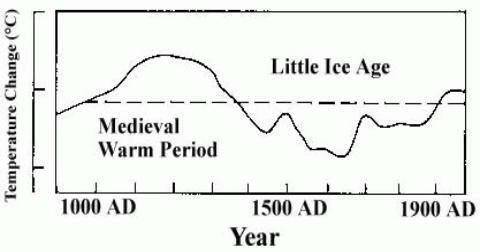 When the IPCC came out with it's first report it presented a proxy reconstruction of past temperatures that showed the climate of the Medieval Warm Period to be warmer than today. As they quickly figured out, they had presented a chart that was counterproductive to their objectives. It's hard to stampede the population of the earth, for UN profit and power, when the thing that you are warning about has happened so recently to no ill effect. This was one of the first inconvenient truths that the IPCC need to disappear in order to achieve their goals. The people who rode to their rescue were Michael Mann and many of the climategate decline hiders from the CRU. These people found that data series could be cherry picked, data series could be used upside down, and analysis methods could be used to torture the data into confession. They presented their first major gift to the IPCC, they disappeared the MWP and they filled their own coffers with research grants. It no longer mattered that history described farming in Greenland; grape growing where it had not happened before or since; an LIA that froze the Thames; that other reconstructions from all over the world showed a major MWP overlapping at 1000 AD. None of it mattered. The IPCC declared that peeeerrrr rrreeevied papers, published in major scientific journals, had made the MWP and the LIA just figments of our imagination. In the period since then there have been many inconvenient truth that needed to be discredited for the benefit of the IPCC. And there have always been volunteers. If a scientist published a paper that questioned some aspect of the IPCC orthodoxy the attack dogs from web sites like Real Climate, Open Mind, and Climate Progress were waiting with personal attacks and buckets of mud to slag off the work. The climategate gang was waiting to prevent the publication of such papers, or, failing that, to publish negative responses to the work. The quality, seriousness, or scientific applicability of the criticism never really mattered. What was important was that there was a reference available that allowed the AGW sycophants to claim, "oh, that paper has been debunked". The latest inconvenient truth that needs to be disappeared is the 12 year trend of no warming in the planet's surface temperature. The IPCC and the politicians are hearing about this often now - and they don't like it. With each year that comes and goes with the trend still flat the voices of AGW dissent get louder and the need to disappear it gets more urgent for the AGW cabal. The evidence for this lack of warming is presented in the post below. Once again, we have people riding to the rescue of the IPCC. In this case those people are David Easterling of NOAA and Michael Wehner of the Lawrence Berkeley National Laboratory. Their paper has been submitted to Geophysical Research Letters for publication. The objective of this post is to review some of the reasons that these authors wish to discount the current flat temperature trend. Given that their objections are very similar to ones that can be found on many of the AGW support web sites, the post will hopefully answer some of those issues as well. Before I begin on the paper, I should note that there are many in the blogosphere that even deny that a flat trend currently exists. The authors only make this claim in an oblique way, concentrating instead on what they consider to be the unimportance of the trend. "We show that the climate over the 21st century can and likely will produce periods of a decade or two where the globally averaged surface air temperature shows no trend or even slight cooling in the presence of longer-term warming." "However, if we fit a trend line to the same annual global land-ocean temperatures for the 1977-1985 period or the 1981-1989 period we also get no trend, even though these periods are embedded in the 1975-2008 period showing a substantial overall warming." First, note that both of their periods are not the "decade or two" long that they claim. Rather they are both only 9 years long. I decided to plot these supposed flat trends for myself to see how they looked. The first period, 1977-1985 (see figure 1) was reasonably flat, but slightly positive. The second period, 1981-1989 (see figure 2) was hardly flat at all. And the part of their statement that specified "or even slight cooling", was definitely not to be seen. The data that I used for my check plots was HadCrut3v. As it happened, I also had an ENSO corrected set of HadCrut3v data available. This data set was generated for this paper by D. Thompson et al. And it was stored on the Real Climate web site. Unfortunately it only runs through May 2008. But it will still serve our purpose. I wanted to see if either of these periods from Easterling and Wehner were flat as a result of being artifacts of ENSO. As we can see, the first period, in figure 1, was slightly flattened by ENSO. Without ENSO the trend becomes more pronounced. But the second period was strongly influenced by ENSO, as can be seen in figure 2. I decided to get a feel of what the trend for that period was, and so I produced a 20 year chart from 1975 to 1995. This period is in the heart of the time where most warmers believe that the AGW signal was clearly revealed. As we can see when comparing the slope numbers on the chart for figures one and three, the ENSO corrected data is one third of the longer trend's uncorrected data and it is fully one halve of the ENSO corrected longer trend. This hardly seems to me to be a justification for claiming that the first period has no trend. Then, comparing figure 2 to figure 3 it looks like the ENSO corrected data from figure 2 actually shows a stronger trend than the main trend in figure 2. It is stronger than either the ENSO corrected or uncorrected trends of the longer period. Even the uncorrected data from figure 2 has 50% of the slope of the long term uncorrected trend. I hardly think that Easterling and Wehner are justified in calling the 1981-1989 period trend-less. Also, it becomes obvious that ENSO had a mild but noticeable effect on suppressing the trend for the first period; and a strong effect on suppressing the trend in the second period. This will become important shortly. The unusually strong 1997-1998 El Niño contributed to unusual warmth in the global temperature for 1998 at the start of this period resulting in only a small, statistically insignificant positive trend. HadCrut3v shows no trend at all. HadCrut3v ENSO corrected shows a tiny amount of warming - much smaller than either of the 9 year samples that the authors give. And the difference between the ENSO corrected data and the non corrected data is actually much smaller than it is in either of the authors samples. The above quote, where they refer to the 1998 starting point, would seem to imply that the current flat trend is at least in part an artifact of ENSO and the choice of an ENSO starting point. But figure 4 shows that just the opposite is true. ENSO is less of a factor than it is for their examples. In fact the difference between the ENSO corrected data and the non ENSO corrected data is tiny. The general community of warmers are ready to grasp the excuse of the 1998 El Nino being the cause of the 12 year flat trend because it suits their purpose. If they would look closer, for only one moment, they would see that the 1998 El Nino was followed, only one month later, by a 25 month La Nina. The effect of these two on the slope of the trend line is basically to cancel each other out. That is why the ENSO corrected and uncorrected trend lines are so close. Still, with all of this discussion, one could argue that the 1977-1985 period is somewhat flattened and that ENSO does not account for it. But what else happened during this period? Well, for one, El Chichon erupted in 1982. This is in the second half of the period and therefore any cooling that resulted would push down the slope of the trend. The massive quantities of volcanic aerosols most likely had a profound effect on the climate for the next 2 or 3 years. And one look at figure 1 for that period of time seems to confirm that assumption. So the flatness of the 1977-1985 period is most likely an artifact of El Chichon. So we now have five reasons why the Easterling and Wehner examples do not constitute samples of the same kind of thing happening before within the crucial signal phase for AGW theory. The last example is very important. In dealing with the 12 year flat trend one of the reasons for dismissing its importance is the expectation that it will not turn into a 20 or 30 year flat trend. The authors exhibit this expectation based on their forgone conclusion that AGW theory is correct and that AGW forcing will overcome the flat trend any day now. They don't consider the possibility of a small number for climate sensitivity and they don't consider the possibility of a long term component of natural variability that might be overcoming any AGW signal. These men clearly do not have an open mind on the AGW question. So how can they pretend to deal fairly with a subject that calls in doubt AGW - or at a minimum, the strength of AGW. The reality of the climate system is that, due to natural climate variability, it is entirely possible to have a period as long as a decade or two of “cooling” superimposed on the longer-term warming trend due to anthropogenic greenhouse gas forcing. why is the temperature not continuing to go up? The stock answer is that natural variability plays a key role  and there was a major La Niña event early in 2008 that led to the month of January having the lowest anomaly in global temperature since 2000. While this is true, it is an incomplete explanation. In particular, what are the physical processes? From an energy standpoint, there should be an explanation that accounts for where the radiative forcing has gone. Looking at the evidence, one must arrive at one of two conclusions. Either the AGW signal is not nearly as strong as is claimed by the IPCC; or there are strong elements of natural variation that are unidentified and undefined. If the former is the case, the AGW alarms need to be turned off. If the later is the case, then we cannot assume the continuation of the AGW trend at any particular time because we don't know what the cycle time for that natural element of variation is. Easterling and Wehner spend a lot of their paper talking about Coupled Climate Model simulations; and how those simulations produce flat trends that are a decade long or longer. Frankly, I fail to see how climate model output is relevant to the discussion of real world variability. No CCMs have ever had their prediction capability validated, and many of them are now only hanging on by their error bars. In addition, the authors used a single run of a climate model, thereby increasing the variability of their data. Consequently, that portion of the paper has little interest for me and it has little relevance to the debate about the significance of the current 12 year flat trend. Both of these periods show a small, statistically insignificant negative trend based on a simple least-squares trend line and there are other periods, such as the last seven years of this simulation, that show a similar lack of trend. This behavior occurs without any simulated volcanic eruptions or solar variability (natural forcing) that could result in a widespread cooling for some period of years and thus is presumed entirely due to natural internal variability. What is the meaning of "natural" internal variability when speaking of a CCM. How is the output of a computer program "natural". What makes our authors believe that the elements of internal variability of a model are the same as the real elements of variability of global temperature in the real world? However, even considering these criticisms, it is clear that the models can and do produce sustained multi-year periods of “cooling” embedded within the longer-term warming produced in the 21st century simulations. Therefore, it is reasonable to expect that the natural variability of the real climate system can and likely will produce multi-year periods of sustained “cooling” or at least periods with no real trend even in the presence of longterm anthropogenic forced warming. Claims that global warming is not occurring that are derived from a cooling observed over such short time periods ignore this natural variability and are misleading. If I may summarize what our authors are saying here, it is, "things happen for no reason". They want to tell us that "natural variability" can be a cause for the current flat trend, but they want to insist that the "natural variability" is some forcing that is simply random noise that we cannot identify. A person would have to be a complete fool to believe that the current global 12 year flat trend has no cause other than that thing are just kind of drifting around. It's shocking that people would make such a suggestion and still call themselves scientists. They are saying that the energy which should be being added to the earth due the increased radiative forcing is simply disappearing or hiding somewhere - who knows where. Climate does not vary without a reason. Our authors seem to not understand the meaning of "natural variability". Natural variability are things like ENSO, PDO, AMO, volcanoes, solar, etc. Natural variability is not some unknown element of unidentified noise. Especially, it is not a 12 year global element of unidentified noise. While the argument against the significance of a 12 year period is applicable when we cannot know of the real natural elements of variability, this is not true for the current 12 year period. That period is in the history books. We can see the effects and account for them. When they are accounted for, the period of time needed for significance should be much reduced. The reason that the current period is so significant is because we cannot point to any natural elements of variability and say, "there is the reason that the trend is flat". This is in contrast to the periods given by the authors where we can easily do this. This is exactly the point that Trenberth makes in his paper. In the case of our authors their use of "natural variability" is simply so much hand-waving designed to get them to their foregone conclusion. So let me repeat my central point here. The IPCC numbers for climate sensitivity are jeopardized by the fact that we cannot identify the elements of natural variability that are causing today's flat trend. This means that either the numbers are too high or that there are very strong elements of natural variability that we have not accounted for and that we have not modeled.